Find out if this natural beauty is the best choice for your kitchen or bathroom upgrade. If your kitchen or bathroom remodel wish list includes natural stone countertops, consider eco-sensitive soapstone. 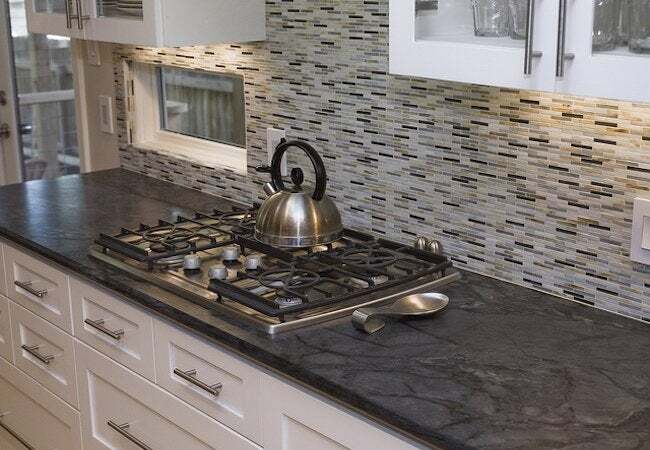 The warm look and cool feel of soapstone countertops add distinctive character to any space it’s installed—and because it’s more DIY-doable than other stone options, the choice can mean substantial savings. Get the info you need here to be an informed shopper at the showroom. Also known as steatite, soapstone has been a favorite of sculptors for centuries. It contains the mineral talc—yes, as in talcum powder—making it relatively soft. 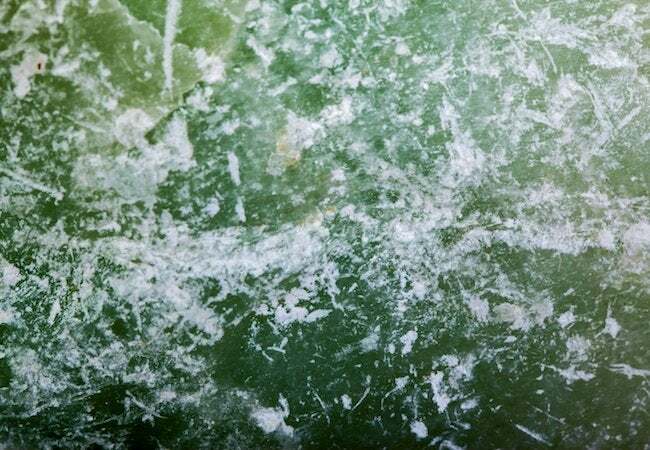 Depending on the amount of talc present, soapstone varies on the Mohs scale (a 10-point ranking system for mineral hardness developed by geologist and mineralogist Friedrich Moh) between 1 and 5; most soapstone in today’s countertops commonly rank between 2.5 and 3.5. That makes it similar in hardness to marble, with a Mohs value of 3, and much softer than quartz, with a Mohs value of 7. While hardness is desirable in a countertop for structural stability, what soapstone lacks in hardness, it makes up in density. Soapstone particles are extremely compact—more so than those of quartz, marble, or granite—which makes it more sanitary and easier to wipe clean. WHAT ARE SOAPSTONE’S PROS AND CONS? Smooth, beautiful soapstone doesn’t require a sealant to protect its good looks. Its impenetrable surface reduces the risk of bacterial growth, always a plus in a kitchen or bath. Often used in the construction of fireplaces, soapstone is among the most heat-resistant stone available, so setting a hot pan on the countertop won’t crack the surface. 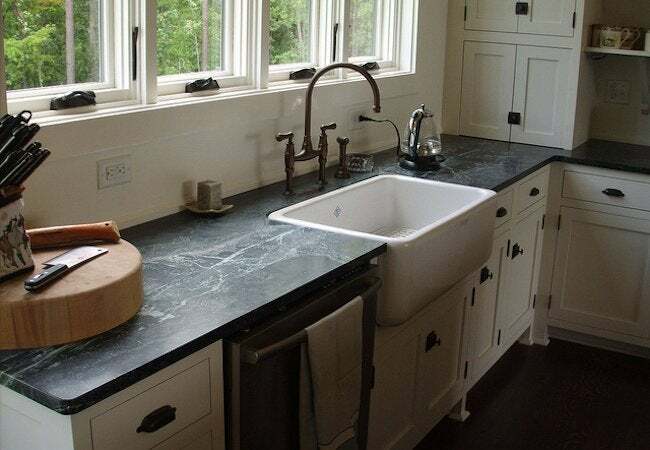 Soapstone darkens over time, however, via a natural process akin to oxidation, so it will eventually develop a distinct patina that some homeowners find appealing and others don’t. The main downside to soapstone, however, is its tendency to scratch or chip under heavy wear. Accidentally dropping a cast iron skillet on the counter could result in a chip, and chopping food directly on its surface would surely leave knife marks. 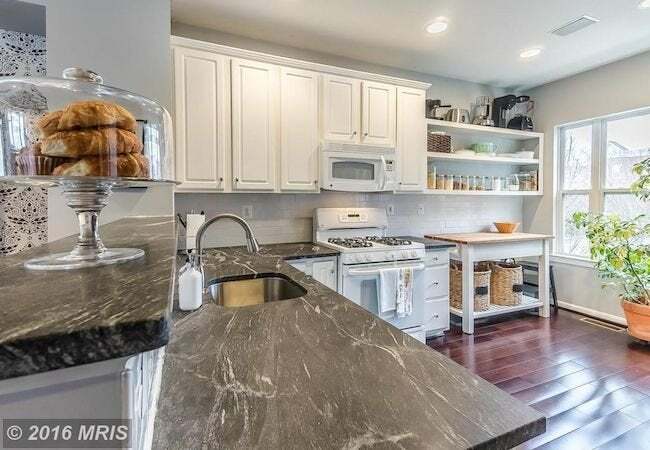 Photo: Zillow Digs Home in Washington, D.C.
Because it’s DIY-friendly, a homeowner skilled in basic carpentry can save money by purchasing soapstone slabs and doing the installation. Raw soapstone slabs range in price from $45 to $85 per square foot, depending on where the stone was quarried and its talc content (lower talc content—and a harder surface—is usually more expensive). Professional installation can raise the cost an additional $50 to $65 per square foot, bringing the total for professionally installed soapstone countertops to between $95 and $150 per square foot. Thicker slabs (standard thickness is 1 ¼ inch), such custom add-ons as grooved drainage boards, and elaborate edge profiles will add to the final cost. As a comparison, quartz and granite countertops, both of which require professional installation, can run as high as $200 per square foot, installed. HOW DO I CHOOSE THE BEST LOOK? Depending on the region where it’s quarried, soapstone ranges in color from soft white and light gray to deep charcoal, with most types exhibiting gentle veining. Some contains hints of pearl, blue or green, but the most prevalent hues are whites and grays. Remember soapstone’s tendency to darken over time: A pale gray will eventually weather to a deeper, richer shade of gray, while a dark gray countertop may eventually appear almost black. And as products of nature, no two soapstone slabs will be identical, so expect a slight discrepancy between joined slabs. To help you decide on a shade, visit a kitchen showroom for some samples that you can study in the lighting of your own kitchen. Keep in mind additional design and color changes you’re planning for the remodel, and imagine how the countertop will look in the finished room. As mentioned, soapstone countertops are one such kitchen or bathroom addition that can be left to the pros or DIYed to better adhere to a renovation budget. 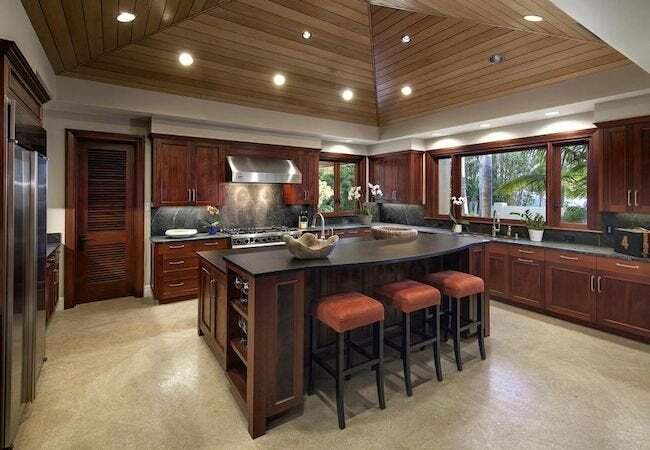 • If you’re having the countertops professionally installed, request that a company representative come out and take your kitchen measurements, instead of submitting your own measurements. That way, you won’t be stuck paying for an error if a slab doesn’t fit. Soapstone fabricators create a template from the measurements and then cut the slab to match exactly. • If you’ve got basic carpentry skills and are comfortable using power tools, you may choose to install soapstone yourself. Due to its high talc content, it’s reasonably simple to cut soapstone slabs with a regular circular saw, fitted with a diamond-tip masonry blade. Holes for drop-in sinks as well as a shaped profile edge can be cut using a router with a diamond bit. You’ll get the straightest, cleanest cuts if you clamp a straightedge to the soapstone to serve as a cutting guide. Be sure to apply masking tape to the countertop’s surface on both sides of the cutline to reduce the risk of scratching the surface with the saw foot during cutting. But it’s recommended that DIYers create a template from thin plywood, like the pros do, and make sure the measurements are precise before transferring the pattern to the actual soapstone. Once the soapstone has been cut, all edges (including the stock slab’s rough square edges) are easy to sand smooth with 200-grit sandpaper. Standard soapstone slabs are 84 inches long, so if your countertop is longer, it will require one or more seams. Professional installers position seams where they’re least visible, such as in front of a sink or a drop-in cooktop. The slabs are heavy and unwieldy, so you’ll have to recruit strong helpers to assist in lifting and positioning the countertop. Soapstone seams are filled with compatible two-part adhesive. Once the adhesive sets, any over-fill can be sanded away. Sinks and cooktops should be installed, per their manufacturer instructions, once the countertop is in position. The standard process for installing a soapstone countertop is to first ensure than the counter base is perfectly level. If not, insert shims beneath the base to level it. The slab installs directly on the base, no underlayment necessary. When the cabinet base is ready, you’ll make all the necessary cuts for seams and cutouts before positioning the slab. Drop-in sinks and cooktops come with their own cutout templates. 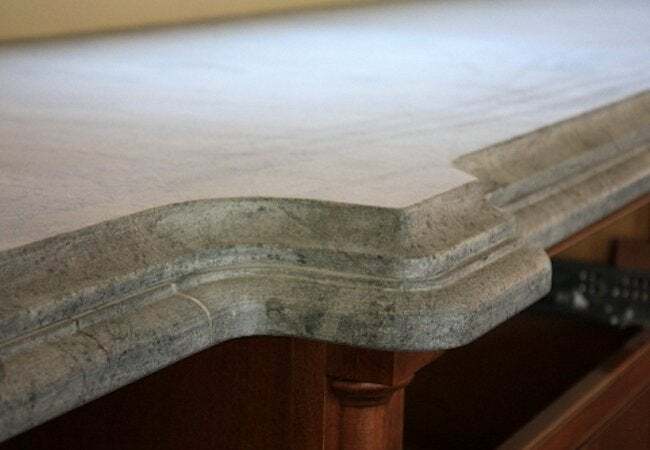 Soapstone is heavy, and once the countertop is positioned on the cabinet base, its weight will hold it in place, but you’ll still need to apply a bead of sealant to the seams on the underside of the countertop, where the slab meets the base. HOW DO I KEEP SOAPSTONE LOOKING GREAT? Because it requires no sealing, soapstone is relatively low-maintenance. With minimum care, your new countertop can retain its good looks for many years. • Enhance your counter’s natural darkening progression by applying mineral oil to the surface every week or two and rubbing it in thoroughly. The mineral oil treatment will make the patina more uniform. It usually takes seven to nine months for the countertop to reach its full patina. • Once the patina is fully developed, apply mineral oil if the countertop begins to look dry to restore luster and sheen. Once or twice a year is usually sufficient. • Clean soapstone countertops with an all-purpose kitchen cleaner or mild soap and a dishrag. • While the heat from cookware straight off the stove won’t damage the countertop, if the pan is rough on the bottom, such as a cast iron skillet, it could scratch the surface. Use trivets! • Chop and dice food on a cutting board, not on your countertop. • Minimize chips and dings that do occur by coloring them in with a matching permanent marker and then rubbing mineral oil over the surface. • Oil and grease can discolor new soapstone, so wipe up spills promptly and, if necessary, rub a bit of acetone (nail polish remover will suffice) on an oil stain to lighten it. Once your countertop reaches its full patina, oil discoloration won’t be a problem. • If your soapstone countertop develops an uneven patina, you can remove it by sanding the entire surface with fine-grit sandpaper, and then applying the mineral oil process described above to help the new patina develop uniformly. • While there are products on the market that claim to seal soapstone against darkening, they cannot penetrate the countertop’s dense surface, so they must be applied once or twice a month. If you’re worried about the darkening effect of soapstone, it might be better to choose a different countertop material such as quartz or granite, which won’t darken over time.